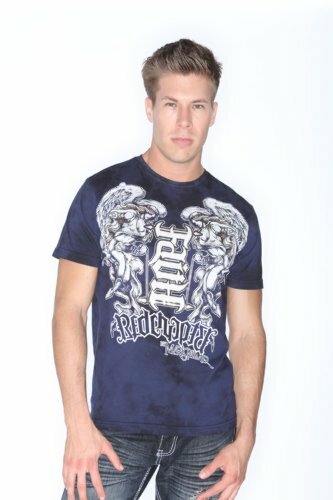 Mens Red Chapter Clothing Ambigram shirt in the Choice Destiny design in blue with gold foiling. The tattoo art style Ambigram reads as Faith in one direction and as Hope in the other. This shirt is in a rich blue color and is very soft from specialty treatment washes. It is accented with Gold Foiling Details on the Ambigram. The background art work features a pair of winged angels.